pCLIPf Vector is a mammalian expression plasmid intended for the cloning and stable or transient expression of CLIP-tag® protein fusions in mammalian cells. This plasmid encodes CLIPf, a CLIP-tag protein, which is expressed under control of the CMV promoter. pCLIPf Vector is a mammalian expression plasmid intended for the cloning and stable or transient expression of CLIP-tag protein fusions in mammalian cells. This plasmid encodes CLIPf, a CLIP-tag protein, which is expressed under control of the CMV promoter. The expression vector has an IRES (internal ribosome entry site) and a neomycin resistance gene downstream of the CLIPf for the efficient selection of stable transfectants. pCLIPf Vector contains two multiple cloning sites to allow cloning of the fusion partner as a fusion to the N- or C-terminus of the CLIPf. The CLIP-tag is a novel tool for protein research, allowing the specific, covalent attachment of virtually any molecule to a protein of interest. The CLIP-tag is a small protein based on human O6-alkylguanine-DNA-alkyltransferase (hAGT). CLIP-tag substrates are derivatives of benzylcytosine (BC). In the labeling reaction, the substituted benzyl group of the substrate is covalently attached to the reactive cysteine of CLIP-tag forming a stable thioether link. pCLIPf contains an improved version of CLIP-tag, termed CLIPf. CLIPf displays faster kinetics in in vitro labeling and fast, specific and efficient labeling in live and fixed cell applications, thereby rendering it a desired research tool for analysis of protein dynamics. Although CLIP-tag is based on the same protein as SNAP-tag®, the benzylcytosine substrates form a separate class of substrates, different from the benzylguanine substrates recognized by SNAP-tag. CLIP-tag and SNAP-tag can be used for orthogonal simultaneous labeling. There are two steps to using this system: sub cloning and expression of the protein of interest as a CLIPf fusion, and labeling of the fusion with the CLIP-tag substrate of choice. Cloning and expression of CLIPf fusion proteins are described in this document. The labeling of the fusion proteins with CLIP-tag substrates is described in the instructions supplied with the CLIP-tag substrates. Unique restriction sites in the regions flanking the CLIPf gene are displayed above the coding strand. The complete sequence for pCLIPf and the control plasmids can be downloaded here . A plasmid map and the sequence of the cloning region can be found in this document. The complete plasmid sequence can be downloaded. This plasmid encodes the gene CLIPf which is a mutant form of the human gene for O6-alkylguanine-DNA-alkyltransferase (hAGT). The codon usage of the gene is optimized for expression in mammalian cells. In the plasmid sequence, the CLIPf gene is encoded from 969 bp to 1514 bp. This plasmid is intended for the cloning and stable or transient expression of CLIP-tag protein fusions in mammalian cells. It is suitable for the efficient production of stable cell lines expressing CLIPf gene fusions. The plasmid contains the CMV promoter followed by the genes for CLIPf and neomycin resistance separated by the IRES of the encephalomyocarditis virus (ECMV), which permits the translation of two open reading frames from one messenger RNA; therefore after selection of stable mammalian cells for neomycin resistance, nearly all surviving colonies should stably express the CLIPf fusion protein. Unless the expression experiments require a pure population of cells, the pool of resistant cells can simply be used, otherwise cell clones can be isolated and characterized using standard procedures. The plasmid contains the β-lactamase (Ampicillin resistance) gene for maintenance in bacteria. The gene of interest can be cloned upstream or downstream of the CLIPf coding sequence, as a fusion to the N- or C-terminus of the CLIP-tag. 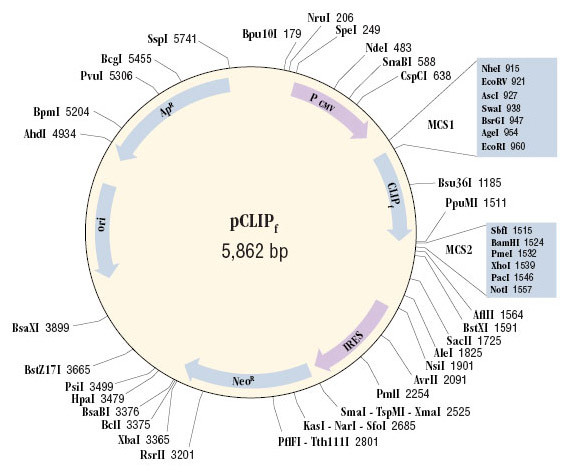 pCLIPf Vector can also be used as an expression control plasmid, expressing CLIPf alone, in which case the CLIP-tag protein is distributed throughout the cell. The CLIPf gene can be isolated from the plasmid using PCR or direct cloning in order to subclone it into a different vector of choice. Storage: pCLIPf Vector is supplied in TE buffer (10 mM Tris-HCl, pH 8.0, 1 mM EDTA) at a concentration of 0.5 µg/µl. Plasmid solutions can be stored at 4°C for up to one week. For long-term storage -20°C is recommended. Jansen, L.E. et al. (2006). J. of Cell Biol. 176, 795. Labeling of Fusion Proteins with Synthetic Probes: US 8,227,602; US 8,623,627; and EP 2 049 499.